Culms 60-180 cm. Leaves bluish-green, more or less strongly glaucous. Inflorescence units with 2(3) rames; subtending sheaths (2.7)3.1-3.8(5.5) mm wide; peduncles (2)3-4(10) mm; rames (1.4)1.7-3(4) cm, not exserted. Andropogon virginicus var. glaucus grows on moist or dry soils of the coastal plain, from southern New Jersey to eastern Texas. Plants growing on sandy, well-drained soils differ from those on poorly drained slopes in being glabrous (rather than pubescent) beneath the subtending sheaths of the inflorescence units, and in tending to have shorter rames. 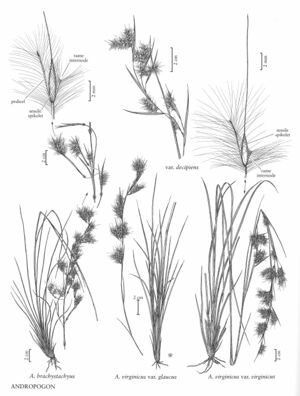 Facts about "Andropogon virginicus var. glaucus"